For the 2011 edition of Sanremo in Flowers the City Hall has decided to postpone the date on March 27th, almost two months after the usual event that used to take place around the end of January. It will therefore be a Springtime edition that will allow the tourists and visitors to enjoy the magnificent mild climate of the Riviera of Flowers. The theme for the 2011 edition that will coordinate all the wagons will be “Italy’s unification and its cities”, which will become part of the calendar of events for the celebration of the 150th anniversary of Italy’s unification. The flower covered wagons parade will take place from 10 AM along the usual ring course on the Lungomare Italo Calvino; the participating cities will follow a theme from which they will gather inspiration for the creation of their wagon which will be judged by a careful jury that will nominate the winner at the end of the parade. 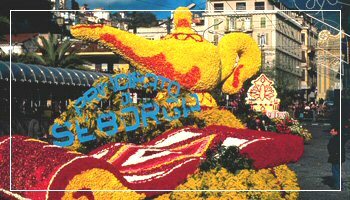 The flower wagon parade will end at about 1.30 PM and will be recorded as usual by Raiuno inside the LineaVerde TV show: an event that will keep millions of spectators in front of the TV screen and thousands of lucky visitors that will roam the streets of Sanremo admiring and smelling the scent of flowers.